Weeks of frustration have finally ended for the champion, and once again he pauses after the game to speak with Norwegian media. Visibly nearly as weary as he is happy, he cannot hide a face-splitting smile. The match is now tied 5-5, and some might say we now have a two-game title contest. The players had had a day to recover from their exertions in game 8, and to earth themselves again from two dramatically different perspectives. 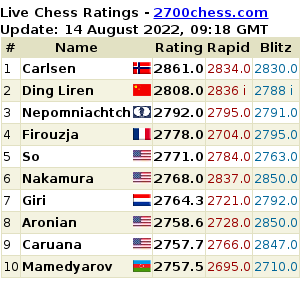 Challenger Sergey Karjakin has seized a 4.5-3.5 lead in his title match with Magnus Carlsen, preventing a record-tying world championship sequence of eight initial draws by winning with black in a heart-stoppingly dramatic game that was far more excitement and emotion than precision. The champ now has only four games left to solve the invincibility enigma posed so far by his Russian adversary. 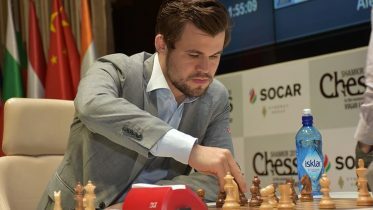 Norwegian Grandmaster Jonathan Tisdall on game 7 of the World Championship Match in New York.